If not for my thesis taking up inordinate amounts of time I would have had this post up on time. Dylan got his notes to me in ample time, I just dropped the ball a little... In any case; my draft is now submitted and I plan to use the next week or two to catchup on a few long awaited bits and pieces. I was really impressed with the pack presented in June. The duplicates were all Australians - with four unique styles represented. Probably the most interesting of these was the newest release from Mornington's #tinnage series. While it was pleasing to see two of the new-to-Australia Firestone Walker beers included, particularly after the great chat I had with Adrian during GBW, while the Courage RIS was a real blast from the past! This beer has been an inevitability since Hawkers launched. I wrote a piece in April of this year (link here) about their core range focus, rather than the slew of single releases other breweries put out. Like all their beers, this is a well crafted example of the style; in this case an Irish Dry Stout. "Hawkers have one of the best core ranges if you’re looking for simple, polished examples of individual styles and their stout follows right along with that philosophy. It’s a dry stout, with a rounded body and the expected coffee and chocolate notes. Oats add a nice, silky note to the mouthfeel. The flavours as a whole are fairly restrained but the balance is great, there’s no perception of the beer being too thin or too heavily trained towards bitterness or roast. It’s just a good dry stout, one I wouldn’t hesitate to recommend to anyone looking for an easy going winter brew." Since drinking this one for the review, I've had countless of these during cold late nights slaving over my thesis draft. 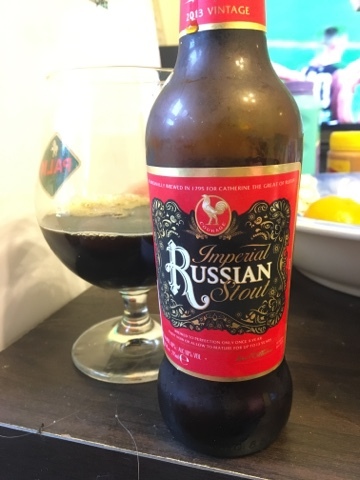 It's a phenomenally easy drinking stout that I can't recommend highly enough! The #tinnage series has been quiet in recent months, I think the Mosaic IPA (#007) was released in September/October last year. 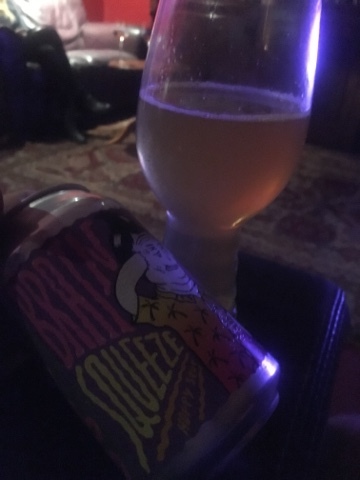 #008 is called Brain Squeeze; a hoppy kettle sour. I'm really keen on hoppy sours, although this is the first one I think I've had from an Australian brewer (Almanac's & To Øl's spring to mind as excellent international examples). "Number 8 in their ‘#tinnage’ series (which has been solid across the board so far) comes Mornington’s hoppy kettle sour mishmash. I’ve drank a heap of Mornington beers but as far as I can remember this is the first sour I’ve had from them. It’s super refreshing, using a hop combo that calls to mind some of the trademark flavours from their wider release beers. There’s some tannic bitterness, citrus peel and juicy orange, with nice palate lifting tartness and a crisp finish. I quite enjoyed this and would have no trouble downing a six pack on a hot day." I feel like I've told the story of this beer a thousand times before. It was Feral's very first GABS beer, back in the days that it was still held at The Local Taphouse in St. Kilda. The beer has been toned back a little since those heady days - however it's still a respectable example of the style. "This is one of those ‘I should really have this more often’ beers. I tend to forget what it tastes like, especially with more black IPAs floating around nowadays. This is first and foremost a Citra bomb, with big, thumping citrus flavours and bitterness supported by a light roast profile. It can be a tough thing to balance a black IPA — I feel like the most important thing is to know what you want to go for and back your ingredients in, rather than just going for either ‘roasty IPA’ or ‘super hopped stout’ (which I taste a fair bit from the style). 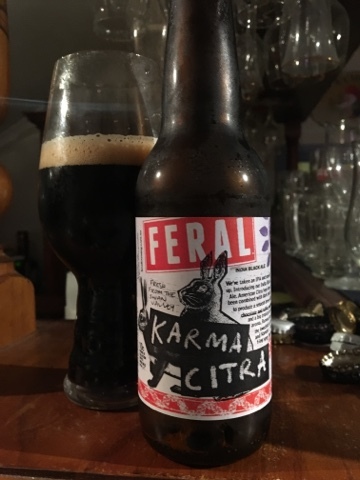 Feral have definitely done that here, clearly using the chocolate/coffee notes in the background to let citra’s flavour come out even more than it would normally via the roast/hop juxtaposition"
I was pleased to see this beer appear in the pack, purely to see if the last bottle of it I had was an exception or the norm. The last one I had was massively over-carbed although not noticeably affected flavour wise, however it could only have been caused by an infection. 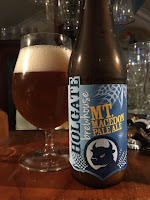 Holgate are a brewery who used to be renowned for quality, I was surprised to see this issue in their flagship Pale Ale. "I remember this beer being very tasty in the past, but recent bottles I’ve had have been overcarbed to the point of ruining the beer. The bottle in the Carwyn pack didn’t quite suffer to that degree, but it was still overcarbed. It’s a shame as the flavours are really nice, with Cascade/Ella/Topaz all showing through on a well balanced malt base. Hopefully it’s just a temporary issue." Although better than the last one, this was still too carbonated for my liking. It's a real shame that Holgate's beers are turning out this way at the moment, as they used to produce quality beers all the time. I may stay off them for a while until I hear more promising reports. 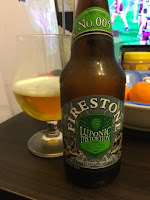 The Luponic Distortion series from Firestone Walker is a seriously cool idea. The beer changes every 90 days and uses a raft of new experimental hops to create different flavour profiles. The base beer is always the same, clocking in at 5.9%, whilst IBU's are kept at a moderate 59. I'm really excited to get to try this - well within it's 90 day window to boot! "I really dig the idea of a rotating IPA series and based on this one I’ll definitely be keeping my eyes out for more. There’s a fairly light, clean malt base with lots of snappy bitterness from the hops. I mostly remember the amount of fruit I got, lots of guava, pineapple, lime and lemon. It sits at about 6% ABV so it’s a reasonably sized IPA, but as a whole it’s definitely on the lighter and more sessionable side flavour wise." It's really refreshing to see an American brewed example of a Session IPA that comes in at under 5% ABV, anything over that is bordering on regular IPA territory for mine. In any case, Firestone Walker employ hops from Germany, New Zealand and the United States in creating this wonderful beer. 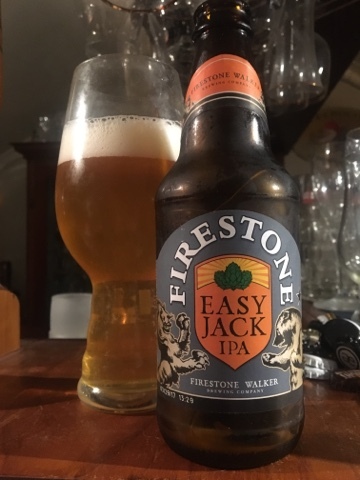 This is going to be my first "properly" imported Easy Jack and I'm really looking forward to it! "4-4.5% is where I like my session IPAs to sit, with punchy bitterness, well rounded mouthfeel, plenty of fruit and/or pine and a crisp finish. This ticks all the boxes, with the bitterness level also right on the money. They’ve really gone big in the fruit varieties with Mandarina Bavaria, Hallertau Melon and Mosaic and it shows, with plenty of stonefruit and juicy citrus. I probably sound like a broken record by now but to be honest my biggest qualm with this beer was that it was a bottle rather than a can! If I can track down the latter I’m definitely drinking more of these." Considering how highly the Firestone Walker guys value freshness, I was really surprised this beer was released here in bottles rather than cans. Cans would make a significant difference to the shelf life of a product that is eminently drinkable. Courage Russian Imperial Stout is a beer steeped in history. This incarnation is supposedly a recreated version of the Russian Imperial that Courage exported to Catherine The Great's court in 1795. After numerous ownership changes the beer was re-introduced to the British market in 2012 by the Charles Wells Brewery after a 30 year hiatus. True to the original recipe the beer is now aged for at least 5 months before it is available to the public. "This was a cool little surprise to get in the pack. Hopefully Noz elaborates on the history a bit - it’s interesting stuff! Nice full body, interesting foamy texture, some apple/pear and dark fruit notes, very dry finish. 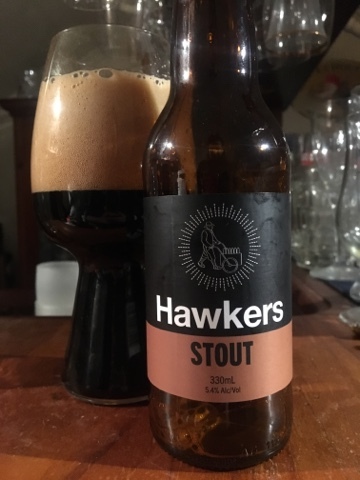 Brett seems to work well with this, doesn’t dominate but adds a few interesting notes you wouldn’t normally expect in a big stout." Delirium Tremens is one of the beers I hear the most when people tell me which beer started them on the path to craft beer. The beer is synonymous with all things good about Belgian beers. It's flavoursome, it's yeast driven and it's boozy. People may not recognize the name, but everyone will recognise the white bottle, light blue label and trademark pink elephant logo of this beer. "I’m a big Huyghe fan, although weirdly enough it’s for their Floris fruit beers rather than their bigger Belgian ales. 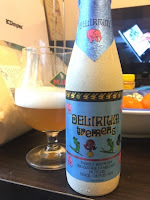 Having said that it has been a long time since I last had a Delirium Tremens so it was great to have the opportunity to crack one again. This is a really nice strong golden ale, the yeast flavour especially stood out to me. There’s a bit of sweetness and booziness but it’s all well balanced. This is another one of those classic beers that everyone should try, good from Carwyn to include it." As Dylan said; "it's one of those classic beers that everyone should try". It's not the best Belgian Strong Pale Ale out there, but it is the most iconic and a gateway beer for many people. Due to my slackness, the July pack has already been consumed by both of us and writing is well underway. With any luck I'll be able to use the remaining days of my post-thesis draft submitting holiday to finalize a few posts that I've been promising for far too long. Sadly the glassware post will not be one of them, as I'm still trying to resolve the issues with Photobucket!